The thing most desired by a young mechanic is a lathe, but the cost of these machines is usually too high to be considered by the average boy, and consequently he is hampered in executing more difficult work. The combination lathe shown in the illustration comes as near filling the wants of most boy mechanics as could be wished, the attachments making it more than a lathe so that various kinds of work other than turning may be accomplished. The sary are few, and, outside of a few parts, it can be constructed by the average boy at home with ordinary tools. The material used for the construction of the frame consists of either well seasoned oak or maple, 23/4 in. wide and 1 1/2 in. thick. These timbers can be purchased surfaced o n all sides, and they must be straight and true to size. The lengths to cut the pieces are given on the general drawing. The end standard at the headstock is cut to the full length so that the upper end is used as a bearing for the headstock spindle. A vise jaw, about 2 1/2 ft. long and of the same kind and dimension material as the frame, is attached with screws made of bolts on the standard, at the tailstock end of the lathe. The feet are made of two boards for each standard, and are of the same material as the frame and 7/8in. thick. After cutting the pieces to the right length, making sure that the ends are square, and boring the holes to receive the bolts snugly, they are put together, the horizontal pieces for the ways and feet at perfect right angles to the uprights. This will insure the parts running freely in the finished machine. All bolts should be supplied with a washer under both head and nut, and the nuts drawn up tightly. A 1 1/4-in. square is laid out on the upper end of each standard, with its center exactly over the center for the shaft, and the wood is cut out to make a square hole, which should be slightly tapering one way or the other toward the center of the standard, to hold the babbitt metal used for the bearing. A 3/8-in. hole is bored, vertically down from the upper end of each standard and in the center, to meet the square hole. This is used as a gate for pouring the melted metal in and later to make an oil hole. Prepare 8 pieces of cardboard to hold the melted metal in the square holes while it cools, by cutting them about 2 in. square and making a hole in the center of each, 3/4 in. in diameter. Two of these pieces are held between the two standards while the shaft is run through them and the square holes. Paint the parts of the shaft used in the bearing with thick white lead, or wrap it with one thickness of writing paper, then line it up perfectly parallel with the ways in both directions and tack the cardboard pieces to the standards. Place the remaining two cardboard disks on the ends of the shaft and tack them to the standards also. Place putty over all the edges and pour melted babbitt metal into the hole at the top. When the metal is cool, remove the cardboard disks and turn the shaft, first in one direction and then in the other, until it can be taken from the bearings. A 1/8-in.hole is then drilled through the metal in the top for an oil hole. The ends of the shaft should be threaded by a machinist, and nuts fitted to it and faced up true. The threads should be cut just long enough to allow the back of each nut to turn freely against a washer placed on the shaft against the standard. A split or solid pulley may be used, as desired, on the shaft between the standards. If a solid pulley is used, it must be slipped on the shaft as the latter is run into the bearings. The pulley is fastened to the shaft with a pin run through a hole drilled in them. If a small flywheel is attached to the outer end of the spindle it will aid in keeping a steady motion. The same procedure is carried out in the construction of the tailstock bearings. The standards for this part are about 8 in. long and are bolted at right angles to and between two pieces that rest on top of the ways. The shaft is threaded full length, which should be done in a lathe by a machinist to get a true thread, and the melted metal run on it to make an internal thread in the bearing. A nut is run on the threads of the shaft between the standards, and provided with a small handle for use in locking the shaft when it is set on work between centers. A small hand-wheel is attached to the back end of the shaft, into the rim of which a handle is set to make the turning easy. Detail of the Various Attachments for Use in Connection with the Lathe for Sawing, Planing and Sanding, and the Shape of the Tools Used in Turning, Together with the Faceplate and Spur Construction face of the face can be turned true. The spur center is made of a 3/4-in. nut, drilled in opposite corners for 1/4-in. pins, 1 1/4 in. long. The drive wheel for this lathe was taken from an old discarded washing machine. Such a wheel is a very common part of various kinds of machinery and usually one that will answer the purpose can be found in a junk pile. One from 20 to 24 in. in diameter will be about right. A 1/2-in. bolt is used for the shaft, which is run through the standard at the headstock end of the lathe from the outside, the threads being previously cut long enough to introduce a nut between the wheel and the standard for clamping the bolt in place. The extending threaded end of the bolt is then supplied with two nuts, one on each side of the wheel hub, and a short piece of pipe is slipped on, to make a bearing over the threads. One of the spokes is drilled and a pin inserted and fastened to receive the upper end of the pitman from the treadle. The wheel is adjusted on the shaft with the nuts on each side of the hub so that its face runs true with the pulley on the headstock. The wheels are connected with a 1-in. leather belt. 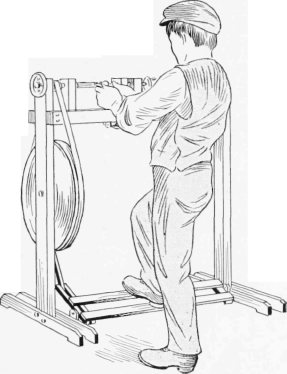 The treadle consists of a frame built up of boards and swung in the centers at both ends on %-in. steel rods, for bearing pins, the bearings being made of wood standards with %-in. holes bored in them to receive the pins. The pitman is made of wood, its length being determined by measurement of the distance between the crank pin and the treadle-arm end when both are at their lowest point. The slide for the rest consists of a 1-in. square steel bar, about 10 in. long, having a hole drilled in one end and threads cut with a %-in. tap. The rest used in this hole is made of a 1/2-in. rod, threaded on one end and bent at right angles on the other. The clamping device for the slide is made of two bars, 1 in. by 3/16 in., fastened to the square bar and extending down between the ways with sufficient ends beneath to attach a wooden clamp block and cam with a handle. This construction is clearly shown in the drawing. If only a lathe is required, the machine would be complete as now described, but the other attachments illustrated will greatly add to its usefulness and the owner will be well repaid by making them. One table is used for the circular saw, planer head, sander, and jig saw, and it is attached on top of the head-stock and tailstock standards with bolts, run through the back edge of the board and the ends of two brackets which are screwed to the back edge of the inner standards. Thumb nuts are used on the bolts to aid in making the change quickly. More than one hole is provided in the back edge of the board, so that the tailstock bracket can occupy the right position for the sander or planer head, as the case may be. The holes in the bracket ends should be somewhat larger than the bolt, to allow tilting of the table. An adjusting screw is substituted for the rest, so that the table can be raised or lowered to suit the work in hand. The circular saw is 5 in. in diameter and should have fine teeth. It is placed on the spindle threads against the nut, and held there with another nut and washer on the end of the spindle. The table is attached over the saw, and the spindle is driven at a high speed. The planer head is made of a wood block, 9 in. long and 2 3/4 in. square. A %-in. hole is bored through one way near each end, as shown in the drawing, and two steel knives, with 1/2-in. holes coinciding with the %-in. holes in the wood, are made and attached with their edges opposite or projecting diagonally from the corners. The holes in the knives being larger than the bolts, makes the knives adjustable for setting the cutting edges. These knives may be made from an old saw blade, ground to size and one edge beveled and sharpened. A brass plate, with holes to fit the spur center, is fastened in the center of the block, on one end, and the other is centered for the cup of the tailstock screw. The adjusting screw for the table is used to regulate the cut. The sander is constructed of a wood piece, 9 in. long and 3% in. in diameter. A groove is cut in one side of the rounding surface to admit the ends of the abrasive which may be fastened there with tacks. An emery wheel can be used on the spindle in the same manner as the circular saw. Procure a wheel, 5 in. in diameter with a 1/2-in. face and having a lead center. The hole should be bored out and tapped to fit the threads on the lathe spindle, and to have the grinding surface run true, this work should be done in a lathe by a machinist. 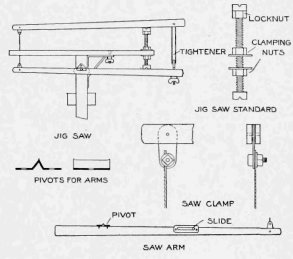 The drawings show the construction of the jig-saw attachment. The standard on which the arms are pivoted is made of a 1/2-in. bolt, threaded for its entire length and with a groove cut in the head and nut to receive the arm pivots. A locknut is used beneath the notched nut to hold the adjustment. Two nuts and washers are used near the center of the bolt for clamping the attachment to the table. The pivots are made of sheet metal, bent and drilled as shown. The small projection at each end of the edge is raised slightly by hammering the corner of the metal. These projections prevent the arms from sliding sideways. The clamps for holding the ends of the saw blades are easily made of thin sheet steel, or brass, with a 3/16-in. bolt and washer at the end for the clamp. The tension of the blade is secured by a piece of wire, an eyebolt and a thumb nut, connecting the rear ends of the arms as shown. The frame is driven by the spur center. The pins are removed from the center and a 1/4-in. pin is inserted in one of the holes so that it will project 5/8 in. The pin runs in a slot cut in a brass plate that is attached to the lower arm. Very serviceable tools can be made of discarded files by grinding them to shape on the emery wheel. Always use a fine whetstone to finish the edge on a woodworking tool.